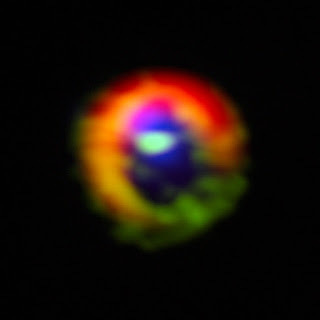 The European Southern Observatory's ALMA space telescope has directly observed for the first time a disc of cosmic dust and gas around a young star, HD 142527. This material is believed to further form into giant planets. Just like stars, astronomers believe that planets are also formed when clouds of cosmic dust and gas start to clump together and gain mass. These planets form from the residual material of a newly born star. The Atacama Large Millimeter/submillimeter Array (ALMA) telescope has helped astronomers look more closely and clearly into space by detecting near infrared light which is hard to detect and invisible to the eye. The telescope which will be fully inaugurated by March 2013, has 66 high-precision antennas, spread over distances of up to 16 kilometers. The ALMA space telescope performs very well on these clouds of gas and dust which are dense and dark. Astronomers using the Atacama Large Millimeter/submillimeter Array (ALMA) telescope have seen a key stage in the birth of giant planets for the first time. 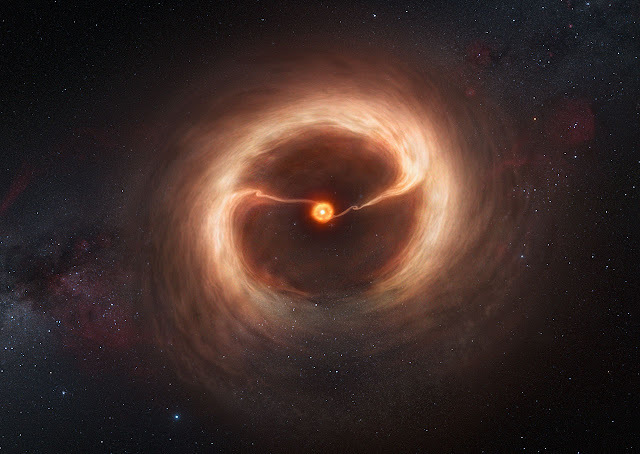 Vast streams of gas are flowing across a gap in the disc of material around a young star. These are the first direct observations of such streams, which are expected to be created by giant planets guzzling gas as they grow. The result is published on 2 January 2013 in the journal Nature. The international team of astronomers studied the young star HD 142527, over 450 light-years from Earth, which is surrounded by a disc of gas and cosmic dust — the remains of the cloud from which the star formed. The dusty disc is divided into an inner and an outer part by a gap, which is thought to have been carved by newly forming gas giant planets clearing out their orbits as they circle the star. The inner disc reaches from the star out to the equivalent of the orbit of Saturn in the Solar System, while the outer disc begins about 14 times further out. The outer disc does not surround the star uniformly; instead, it has a horseshoe shape, probably caused by the gravitational effect of the orbiting giant planets. According to theory, the giant planets grow by capturing gas from the outer disc, in streams that form bridges across the gap in the disc. Casassus and his team used ALMA to look at the gas and cosmic dust around the star, seeing finer details, and closer to the star, than could be seen with previous such telescopes. ALMA’s observations, at submillimetre wavelengths, are also impervious to the glare from the star that affects infrared or visible-light telescopes. The gap in the dusty disc was already known, but they also discovered diffuse gas remaining in the gap, and two denser streams of gas flowing from the outer disc, across the gap, to the inner disc. “We think that there is a giant planet hidden within, and causing, each of these streams. The planets grow by capturing some of the gas from the outer disc, but they are really messy eaters: the rest of it overshoots and feeds into the inner disc around the star” says Sebastián Pérez, a member of the team, who is also at Universidad de Chile. The observations answer another question about the disc around HD 142527. As the central star is still forming, by capturing material from the inner disc, the inner disc would have already been devoured, if it was not somehow topped up. The team found that the rate at which leftover gas streams onto the inner disc is just right to keep the inner disc replenished, and to feed the growing star. Another first is the detection of the diffuse gas in the gap. "Astronomers have been looking for this gas for a long time, but so far we only had indirect evidence for it. Now, with ALMA, we can see it directly," explains Gerrit van der Plas, another team member at Universidad de Chile. Image on the left shows actual ALMA observations of the disc and gas streams around HD 142527. This residual gas is more evidence that the streams are caused by giant planets, rather than even larger objects such as a companion star. "A second star would have cleared out the gap more, leaving no residual gas. By studying the amount of gas left, we may be able to pin down the masses of the objects doing the clearing.” adds Pérez. Nevertheless, the astronomers aim to find out more about the suspected planets by studying the gas streams as well as the diffuse gas. The ALMA telescope is still under construction, and has not yet reached its full capabilities. When it is complete, its vision will be even sharper, and new observations of the streams may allow the team to determine properties of the planets, including their masses.